Many people adore felting. Perhaps it's because of the pleasure of stabbing away your frustrations, much like hammering metal work jewelry? Well, you can merge two crafts in one and make your own felted bead jewelry. While it is possible to felt outlines, it can be tricky for small felted balls. Embroidered felted beads are the way to go! Note : This project is great if you have any left over wool roving from making dryer balls! So this creative workshop "Diviya" shows how you can embellish with needle and thread. Note, the tutorial assumes you know how to felt round balls so there are no instructions for these. Instead, the pictures show how to decorate and make up the necklace. There are actually two ways that you can make them. Wet felting or needle felting. Take your pick - the tutorials for both can be found here on the Feltmakers site. The tutorial is in Russian. The pictures are clear enough. But if you need to translate it, either use Google Translate or follow my favorite method. For computer users, use the Chrome browser, right click and select translate to English. For mobile device users, use the Chrome app (free) and agree to the translation when asked. Felting is a ton of fun. I prefer wet felting over the stabbing myself. 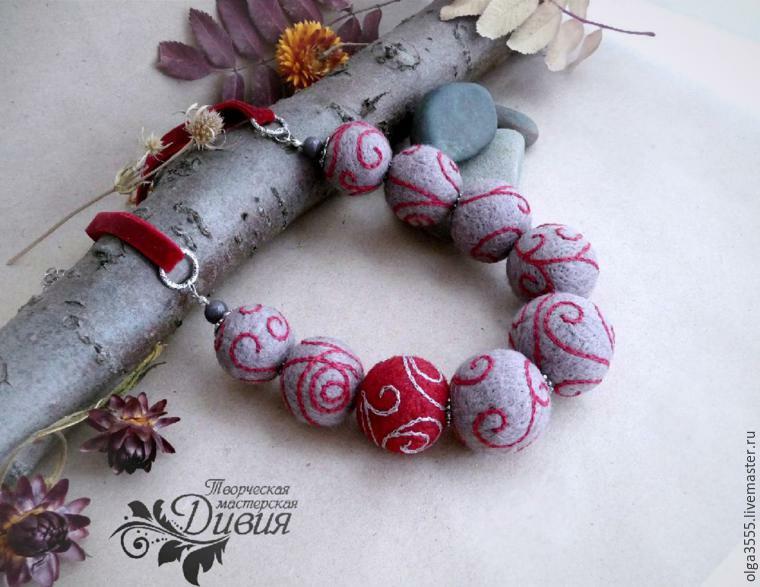 I have been noticing more and more jewelry that includes some felting. Sadly there will always be someone who's allergic to it. That does seem to be the way for all jewelry though doesn't it.